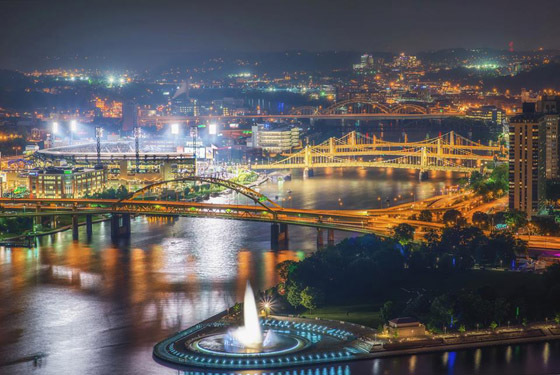 The fountain at Pittsburgh's Point State Park is working again. Photo by Dave DiCello. While getting a dish of Breyers ice cream last night, I noticed something odd... the package didn't say "ice cream." Instead, in the lower right hand corner was the title "Frozen Dairy Dessert." I visited the Breyers web site. The front page makes several references to ice cream, but no mention of frozen dairy dessert. Anything that does not meet both of those requirements is not considered ice cream. 5) Why did Breyers make the change to Frozen Dairy Dessert? Our consumers are at the center of every recipe decision we make. We work hard to understand what people want most and work to give them the best possible product experience. People have told us they have various flavor or texture preferences. For example, some tell us that they want a smoother texture, which is what we’re able to deliver with our Frozen Dairy Dessert products. Yeah, in addition to milk, cream, and sugar, I'd like five different types of gums and stabilizing agents. And don't forget the corn syrup. Yum. Categories: Hypocrisy, KGB Opinion, WTF?